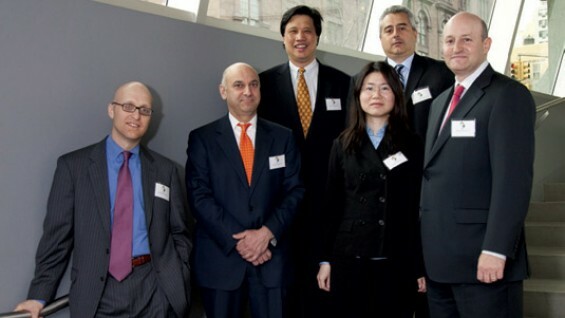 From left: Raymond G. Falci (ME’86), Sanjeev Handa (CE’84), Lawrence Ng (EE’78), Helen Chien (EE’92), Arthur Caramichael (CE’89/MCE’90), Jeffrey S. Hersch (EE’87). A panel discussion for an enthusiastic crowd of Cooper Union engineering alumni and juniors, seniors and graduate students took place the evening of Thursday, March 25 and addressed the pressing question: What does it take to work in the financial services industry today? Moderators—and co-chairs of the Alumni on Wall Street affinity group—Raymond G. Falci (ME’86), Managing Director, Cain Brothers and Company, LLC, and Lawrence Ng (EE’78), Managing Director, Wall Street Systems, Inc., led a panel of four senior Wall Street professionals consisting of Arthur Caramichael (CE’89, MCE’90), Managing Director, Standard & Poor’s Risk Solutions; Helen Chien (EE’92), Senior Quant Developer, World Quant, LLC; Sanjeev Handa (CE’84), Managing Director, TIAA-CREF; and Jeffrey S. Hersch (EE’87), Managing Director, UBS Securities. Moderators and panelists alike spoke with candor, clarity and passion about their experiences after they graduated from The Cooper Union and about how, over time, with the acquisition of advanced degrees and the application of an extraordinary work ethic, they rose to leadership positions. They described their current jobs and explained how their work fits into the broader context of their companies and of the financial services industry as a whole—for example, whether they worked on the “buy side” or the “sell side,” or in their company’s technology or business units. They then spoke about the career paths that led them to Wall Street and about how current Cooper Union engineering students or recent graduates might emulate them. Finally, they talked about the most valuable skills Cooper Union graduates can bring to their search for jobs on Wall Street. The speakers were unanimous in agreeing that the three biggest advantages students at the Albert Nerken School of Engineering have in the competition for admission to prestigious graduate schools and entry into the Wall Street workforce are that they have no fear of advanced mathematics, they are accustomed to working incredibly hard, and they are outstanding problem solvers. After the formal presentation, the moderators opened the floor for a very lively and substantive discussion and question-and-answer session between the audience and the panelists. The takeaway for junior Kevin Yeung (ENG’11): “Reading about how to get into finance and actually hearing about it are two completely different things. The latter can give you lots of little—but important—tidbits of information you just won’t find in books or on websites.” Then the whole group enjoyed a reception where conversation and one-on-one networking lasted well into the evening. Following the event, Eric T. Hirschhorn (ME’89), Managing Director, Citigroup Global Markets Inc., took over from Larry Ng the co-chairmanship of the Alumni of Wall Street group. Under Eric’s and Ray Falci’s intrepid leadership —and with the assistance of one of The Cooper Union’s newest alumni, Rohan K. Chauhan (IE’09, MCE’10), who is starting in the equity trading division of Credit Suisse Group AG in July—we have launched the “Cooper Union Alumni on Wall Street” Linked In group for students and alumni interested in pursuing or advancing in financial services industry careers.